Let me start by saying I didn't expect a gold refractor autograph, or anything close to that. What I did expect was maybe, just maybe ONE serial numbered card, and at the very least a blue card. All I wanted was one "cool" card. Anyone want to know what I got in my blaster? Oh, I got air. It was a box of air. I got the one gold card per pack, and the rest of what was promised, but nothing cool. I was debating last night on finishing the BCP set since I used to do that each year but I don't really see myself buying anymore of these. I have some doubles that I would be willing to trade for cards I don't have. There was no Jeter, no Pujols, and no A-Rod in the whole box. 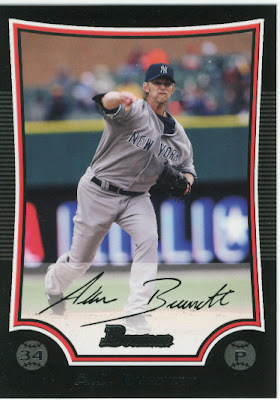 I did get a Burnett card in the worst photoshopped Yankee uniform ever. The "New York" on the away uniform on the card goes straight across, but on their real uniforms it is curved. Bowman was released in June. Burnett has been a Yankee since March. Are they really that lazy to not have taken a single picture of him in 3 months? Stupid. I also made a small, yet stupid detour on my way home from class today at the rip-off store as I call it (Toy Wiz). They were charging $67.99 for a hobby box of OPC. That tells it all. I'll be back with that story, I just got home from the gym and need a shower. blasters are for suckers... it's to the point now that you have to buy boxes. can you post a pic of the Burnett card? I think we all could use a laugh with the way the weather has been lately. I purchased a few hobby packs of this set ad pulled a few yankees including A-Rod and an A-Rod/Jeter (best bud) card. I THINK maybe a few others. I have yankee cards intoxicating my collection, so let me know if you want to work something out. LOL, that is a horrible job. I would think it would be MORe effort to make it straight rather than making it curve, which is of course the normal way. Topps and Bowman have been horrible with their photoshopping this year. I got the Jeter if you want him. I could throw together a small package together for some Cubs in return.